A Colonial Era Railway Station That Still Shines! It is located at Jalan Sultan Hishamuddin. The building was designed by Arthur Benison Hubback (AB Hubback). He designed most of the distinctive buildings of Mughal architecture in Malaysian including Masjid Jamek. It is more than 100 years old. It was the Central Railway Station. Now it is just a stop for commuter train. The main station is now in Plaza Sentral. Inside the building is Heritage Hotel. It is an old Hotel but has been refurbished but still maintains it old culture. There is also a Bar. It still has the old oak bar stand. There is an elevator which manually open and closes. It now a thing but a piece of history of malaya. This was the real malaya. Opposite the building is the Administrative office. there is an underpass which you can use to go over but you are not allowed into the building. If you are an architecture and history buff, you will love this old building. It is the old KL main train station and it is in between Sentral Station and Chinatown, so it is easily walked from either end. Worth the visit even just for the amazing photo opportunities. This is a fantastic example (still intact) of Mughal architecture – the best in Malaysia perhaps. 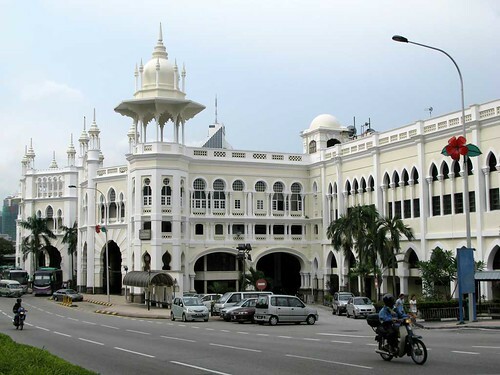 It is the old main railway station for Kuala Lumpur, situtated very near Central Market, Merdeka Square and the National Mosque. It’s a beautiful sight, whether you are just driving past, or stop to take it all in. In function, it has been usurped by the modern KL Sentral station now, but the architecture is hard to beat. Fabulous! The old KTM station is almost without argument one of the most beautiful pieces of architecture from Malaysia’s by-gone days. Not sure what the building is used for nowadays, but it’s worth a visit if only to take a few awesome photos of it and it’s also gorgeous twin across the road. The station is best accessed by taxi, but is also walkable from Chinatown (Petaling Street), Central Market, Merdeka Square, Sultan Abdul Samad Building, KL Sentral and Little India (Brickfields). Who would think that a railroad station could be a great place to visit… but it is! A beautiful islamic architecture gives this train station a special touch that makes it very interesting to see. 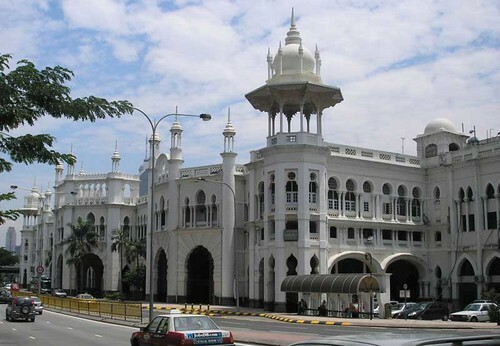 Located on Jalan Sultan Hishamuddin in Kuala Lumpur, the Kuala Lumpur Railway station is one of the best examples of colonial architecture in Malaysia. The attractive part of this monument is that it is gleaming with white with Moorish arches, balustrades, minarets and cupolas. The monument was designed by architect A.B. Hubbock, who is also known for designing the striking Masjid Jamek. Arthur Benison Hubback, a British Architectural Assistant to the Director of Public Works, undertook the design of the station. Having served in India, he utilised his knowledge of Anglo-Asian architecture in the region on the station’s design. The “Neo-Moorish/Mughal/Indo-Saracenic/Neo-Saracenic” style was not uncommon at the time. Similar structures, such as the Sultan Abdul Samad Building (designed by A.C. Norman, completed 1897), the Old City Hall (designed by A.B. Hubback, completed 1904) and the Jamek Mosque (designed by A.B. Hubback, completed 1909), pre-date Kuala Lumpur station. Since the building was constructed in 1911 which was then Malaya was under the British rule, the railway station bears the specification of railroad stations in England and included an iron roof capable of withstanding up to 3 feet of snow. Before the new building was constructed, the railway station used to be just a structure with attap or thatch-roofed shed. 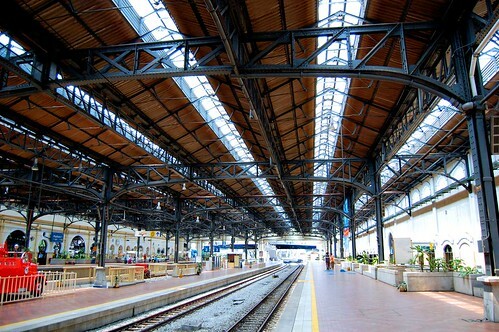 It had been a railway station since the first railroad line was constructed in 1886. 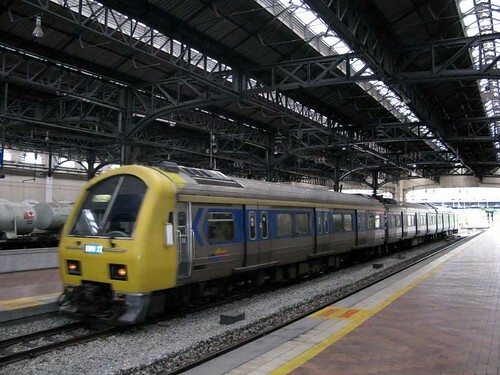 Since then the railway station has been serving its purpose for over 90 years as the city main intercity rail terminal until it was replaced in 2001 by the state-of-the-art KL Sentral Station, a few streets to the south. Currently only KTM Komuter trains pass through this historic station. Although the station’s role as the city main rail terminal has been replaced, it still is one of the city’s most notable landmarks. A lot of photography enthusiasts are attracted by the station unique architecture. As such the monument remains one of the most photographed buildings in the country. The best view of the station can be captured from Jalan Kinabalu. Other than serving as a railway station, the building also houses a colonial-era Heritage Station Hotel which was one of the grandest in its time. The hotel continues to remain in this building until now. The easiest way of reaching the building is by taking the KTM Commuter since KTM commuter is the only train that passes it. Other ways of reaching it is by taxis as well as buses. Golden Triangle of Kuala Lumpur – The Golden Triangle is a modern and stylish district with 5-star premier hotels, including the Mandarin Oriental and shopping malls such as Pavilion KL, Sungai Wang Plaza and Berjaya Time Squares. Moreover, the Golden Triangle is Kuala Lumpur’s main shopping and nightlife district with countless bars and pubs. It’s absolutely a must-visit tourist destination if shopping and clubbing are your favorite nightlife activities. Travelers, Beware of These Scams! The Largest Shopping Mall in Malaysia? Can You Afford to Climb Mountain Kinabalu?